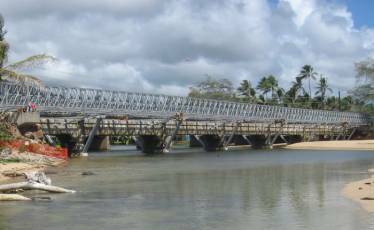 Portland bolt was chosen to provide custom U-bolts and tie-rod assembles for the retrofitting of the county sewage line that hangs below the Wailua Cane Haul Bridge in Kauai, Hawaii. These were not ordinary stainless U-bolts and tie-rods; they were specified from the engineer to be F593 Group 2 Condition CW. F593 is a specification that not many people are familiar with but the experienced sales staff at Portland Bolt has worked on many federal and military projects in the Pacific Islands that require this grade of stainless and will make sure you get exactly what the engineer has specified. We are familiar with the seven groups of F593 as well as the many conditions and stamps required to meet the specification. We will also provide full traceability for our bolts in an automatically generated email the day after the order ships to please even the most thorough inspectors. With Honolulu Freight Service having a terminal in Portland, whether your product is stainless steel or hot dip-galvanized from our own galvanizing tank, we can delivery your product quickly and economically.